First I want to say when I read a book such as this, I want it to come from an author who has actually by example showed me that what he is writing about actually works. A theory is great, but an application is the best. Darren Hardy walks the talk. His life shows us the results of The Compound Effect in a positive way. As the book points out everybody’s lives show the results of The Compound Effect, either positive or negative. 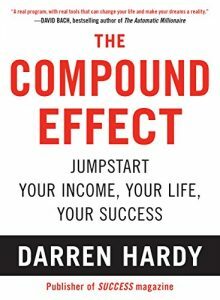 One of the things I loved about this book was Darren’s personal examples of how he has used for his own benefit The Compound Effect. He made it personable in relating many of his experiences of growing up with his “coach” dad and how discipline was ingrained into him at a young age. The book breaks it down into workable steps and the book makes available online for free to download the tracking forms, etc. that you will need to help bring a lasting change into your life. Basically like Darren Hardy’s mentor, Jim Roan says “Everything counts.” And it does, each and every choice we make every single day. If you’re looking for a step by step book to get control of an area or many areas of your life (whatever it may be) this book is a valuable resource. I am grateful that he put down in writing step by step making it easier for us to follow in changing our lives. Thank you, Mr. Darren Hardy. This entry was posted in Doing Your Part and tagged darren hardy, review of The Compound Effect, The Compound effect book review. Bookmark the permalink.